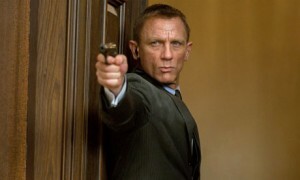 Daniel Craig is James Bond in Skyfall. The 2012 action-adventure thriller Skyfall, the 23rd installment of the James Bond series, the longest-running franchise in film history Box-office smash, arrives on Digital HD Feb. 5, 2013 (across all digital stores, including Amazon, CinemaNow, iTunes, PlayStation, VUDU and Xbox Live), followed by its release on disc in a Blu-ray/DVD Combo Pack and as a single DVD, on Feb. 12, 2013. Directed by Oscar winner Sam Mendes (American Beauty) and starring Daniel Craig (Cowboys & Aliens) as superspy James Bond (that’s Agent 007 for those who want to keep it professional), Skyfall is the highest-grossing Bond film of all time, having taken in more than $1 billion across the world since its international theatrical premiere in November, 2012. In the movie, Bond’s loyalty to his MI6 boss M (Judi Dench, Jane Eyre) is tested as her past returns to haunt her. With MI6 now compromised from both inside and out, M is left with one ally she can trust: Bond. 007 takes to the shadows – aided only by field agent, Eve (Naomie Harris, Ninja Assassin) – following a trail to the mysterious Silva (Javier Bardem, Eat Pray Love), whose lethal and hidden motives have yet to reveal themselves.